Any pair of athletic cleats can be used for field hockey, but the type of shoe depends on the playing surface. The stick has a curved head, is rounded on one side and is flat on the left-hand side. The ball can only be touched with the flat side of the stick. The stick is made of hardwood with a minimum weight of 12 ounces and maximum weight of 28 ounces. 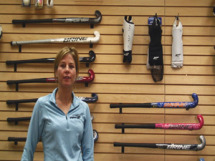 Tara Jelley-Danielson, former US national field hockey player and product and marketing developer at Brine, discusses picking out the right field hockey stick for your daughter.